has hidden her extra toes in this photo. But we hope her Sparkling Purrsonality shines through so Feline Fans rush to Last Hope in Wantagh and Someone wonderful adopts Polly lickety-split. Polly is 2 yr old and rescued from an elderly hoarder in Holbrook. 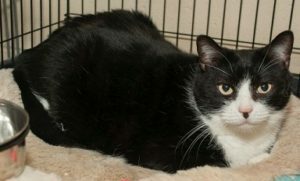 This entry was posted in Adopted, Adopted Cats, Adult, Cats, Female, Wantagh Adoption Center. Bookmark the permalink.